Brake & Lock safety system our retractable leash could extend up to 16 ft. You could simply press the middle button to stop the leash from stretching automatically, and slide another button backward to lock the leash, staying at a constant length. Slide the button forward to restore the automatic extension of the leash. 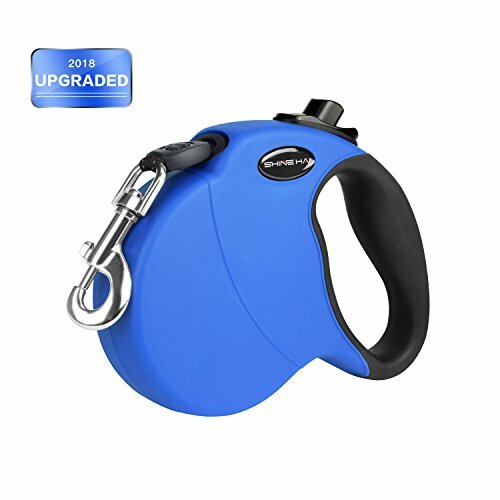 Parameters Color: Blue Maximum Tension: 110 lbs Adjustable length: 16 Feet Rope Diameter: 0.6 inches Dimension: 7.3 x 5.4 x 1.4 inches (L x W x T) Weight: 0.917 pounds Material: PP + TPE Casing, Enhanced Polyester, Zinc Alloy Hook Package 1 x Retractable Dog Leash & Multilingual specifications Warning Make sure that all parts of the leash and your dog's collar are in good condition. If any part of the leash or your dog's collar is damaged, frayed or broken, please do not use the leash. Never try to open the plastic casing, disassemble any other parts, the spring inside may cause unexpected injuries. DURABLE AND STRONG - Upgraded technology for the dog leashes, NEVER need to worry about the dog leash snap, quickly fray, or can be easily chewed through, suitable for any types of dog up to 110lbs in weight, works for powerful large dogs, as well as medium sized and smaller dogs. EXTRA LONG AND SAFE RIBBON - Our retractable dog leash could extends up to 16ft, gives the dog enough freedom to walk ahead a little without going too far away from you. EASY TO BREAK AND LOCK BUTTON - The reliable lock button ensures the capability to adjust the length of the leash as you need. Make sure the leash to stay at a constant length to guarantee the safety of your dogs and yourself. Press the stop button to stop it, and slide the lock button backward to lock the leash. Slide the lock button forward to restore the automatic extension of the leash. VISIBLE AT NIGHT - With the reflective material on the edge of the ribbon, the leash is visible at night by reflecting the light, which provides the secure environment of walking. COMFORTABLE GRIP AND HASSLE FREE WARRANTY - Ergonomic TPE anti-slip handle is easy and safe to grip, even when your dog is pulling and running. 100% Support are back to you, feel free to contact us directly if you have any question or problems. If you have any questions about this product by SHINE HAI, contact us by completing and submitting the form below. If you are looking for a specif part number, please include it with your message.